Crispy homemade bun, special AlmazanKitchen sauce, special crispy bacon, fresh iceberg salad for crunchy texture and a creamy fried egg on top… We made this burger in our secret forest fireplace, on fire, as always. Can you do it by yourself? We bet you can! Go and prove it to the whole world, especially for yourself! Recipe is down below! Grind handful of dried basil along with 1 tsp. of salt and 1 tsp. of pepper in the mortar using pestle. Take the wooden bowl, mix ½ cup of homemade mayo with 1 tbsp. of homemade ketchup, 1 tbsp. 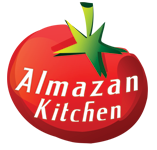 of white balsamico and handful of chopped dill to make special AlmazanKitchen homemade sauce. Fry until crispy golden for both, 100g of homemade bacon along with red onion rings. Cut in half homemade bun and warm it in the pan we’ve been frying bacon before. Form a patty from the beef mince coated in spice mix. Cook it for 2.5 min each side, plus 2.5 min for each side for the doneness you want. Build the burger: bun, sauce, iceberg salad, beef patty, bacon and few drops of sauce, onion rings, fried egg and cover all with bun. Press just a little bit.